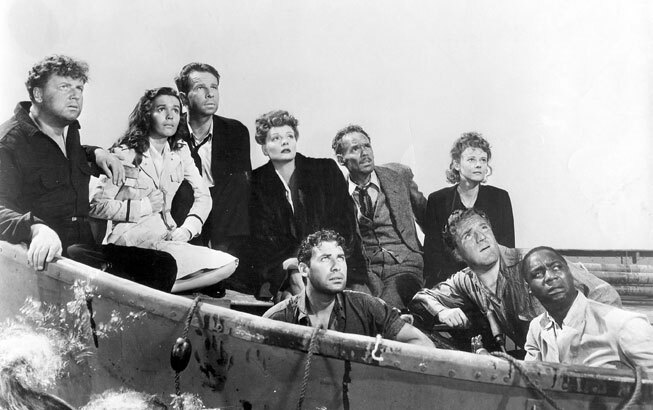 Recommendation: LIFEBOAT (1944) – An Underrated Gem | THAT'S ENTERTAINMENT! Welcome to my first Film Friday post! Each Friday I’ll post a classic film recommendation. I’m not much for modern cinema; I’ve only seen two new movies in the past year — THE GREAT GATSBY (a mediocre Luhrmann special) and OZ: THE GREAT AND POWERFUL (a film completely lacking in humanity). I suppose I am a bit of a film snob. But I have to be honest with you: my preferences have always been television and theatre. Movies are a definite third. Most of my love for film stems from an appreciation for the wonderful actors and personalities that have shaped American cinema, and on a larger scale, the American culture. Most of these recommendations will be centered around a certain star that I believe to be important. Today’s recommendation is Alfred Hitchcock’s Lifeboat (1944). 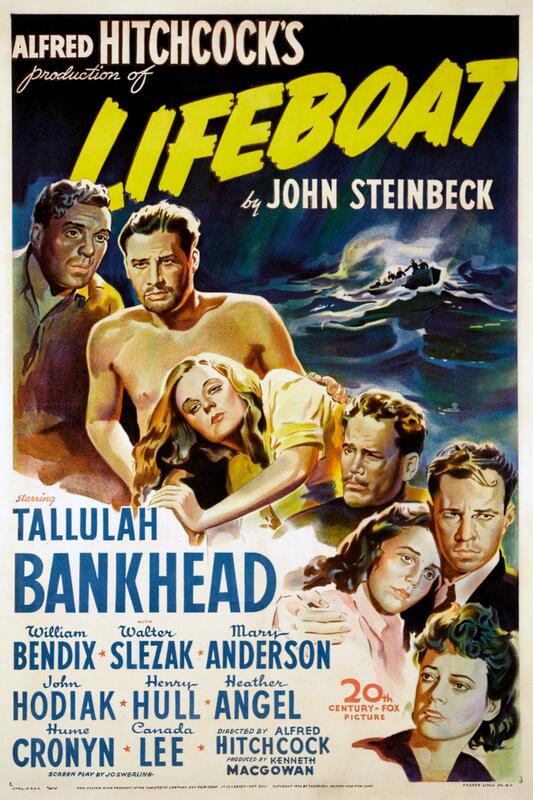 It stars, among others, Tallulah Bankhead, William Bendix, John Hodiak, and Walter Slezak. In the Atlantic during WWII, a ship and a German U-boat are involved in a battle and both are sunk. The survivors from the ship gather in one of the boats. They are from a variety of backgrounds: an international journalist, a rich businessman, the radio operator, a nurse, a steward, a sailor and an engineer with communist tendencies. Trouble starts when they pull a man out of the water who turns out to be from the U-boat. 1) The Wartime setting and the complexity it adds. What makes this film so fascinating is how ridiculed it was upon release for portraying a smart German who is able to outwit the entire crew. Of course, that criticism is indicative of completely narrow thinking. In the first place, how could a stupid villain be menacing? If he was stupid, he would not be a worthy opponent. Furthermore, the film is allegorical in its representation of the Allied forces – fascism, communism, capitalism – and the necessity of working together to outsmart a common enemy. Volumes could be written in analysis of this film and its complexities. 2) The casting. TALLULAH BANKHEAD! For you uncivilized heathens who might not know of Ms. Bankhead, she was a legendary stage actress who starred in many classic shows including The Little Foxes and The Skin of Our Teeth. She made very few films. Lifeboat is the best of her entire film career. She’s so dynamic in this film. An excellent fit for the role of the spoiled fast-talking Connie. Some modern reviewers find her performance to be over-the-top. Rubbish. Not only was that the then-accepted style of acting, it is COMPLETELY in-character. This is the great Tallulah in her prime and truly the only film example of her theatrical magic. She’s American – privileged, loud, and sexier than ever. The night scene with her and John Hodiak… Wow! 3) It’s a Hitchcock film. Need I say more? This film is incredibly underrated. It’s nuanced, complex, and I would love to read your reactions to this film. If you’ve seen it, please comment! If you haven’t and would like to, let me know!